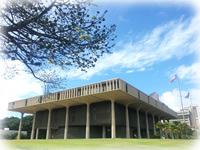 The chamber level includes both House and Senate chambers, clerk's offices and other support offices, as well as the Auditorium, Legislative Reference Bureau Library, security, snack shop, and ATM machine. The street level entry to the Capitol Building features an open rotunda and public entry to the galleries of the House and Senate chambers. The Second floor includes Senators' offices and meeting rooms. The Third floor includes Representatives' offices and meeting rooms. The Fifth floor contains the Governor's and Lieutenant Governor's offices. A short video with information on how to get here, where to park, what's located on each floor, and shots of the building's unique architecture.